Do any species or animals migrate away from Galapagos? When it comes to seasons in the tropics, most of us were taught that there are none. But such teachings couldn’t be any further away from the truth when it comes to a place as unique as Galapagos. While the archipelago is geographically equatorial, two very distinct seasons are at play here throughout the year. This is also why, when asked about the best time to come, we always answer by saying that the only “bad time” in the Galapagos is when you aren’t here. What triggers the climate in Galapagos is the presence or absence of winds. Around late-December/early-January, the winds pretty much cease and, gradually, doldrums take over. It isn’t until later on, around April, that the winds return and the cooler/dryer weather takes over the islands. Wildlife uses weather patterns to match up the best environmental conditions with their reproductive needs. The definition of best environmental conditions is quite simple: it all has to do with elevated food availability, adequate nesting habitats, and other incremental alterations in the environment that trigger hormonal changes. These hormonal changes manifest themselves in physiological and behavioral alterations. This dynamic is a big reason for why these highly islands can be visited at any point throughout the year. While conditions may change, they don’t never necessarily ever reach extremes (these types of stark contrasts only occur at different latitudes). So, the answer to the question “Do any species migrate away from Galapagos?” is NO …except for one species in particular. Every year, as soon as the hot season has fully set in, the Galapagos Albatross – the largest sea bird in the islands and a member of our BIG15 – packs its bags and heads for the cooler southern ocean. They don’t migrate out to another continent or oceanic islands, but instead follow the nutrient-rich waters and wait for the winds to gradually return to Galapagos. The last individuals will be seen around the first week of January, and then it’s Au revoir! until the first days of April. And guess what? Earlier this week, we saw that the first albatrosses for this season officially landed on Española Island – the only piece of land that they call home. Yacht Isabela II was lucky enough to spot a few individuals on land while some were hovering over the island. 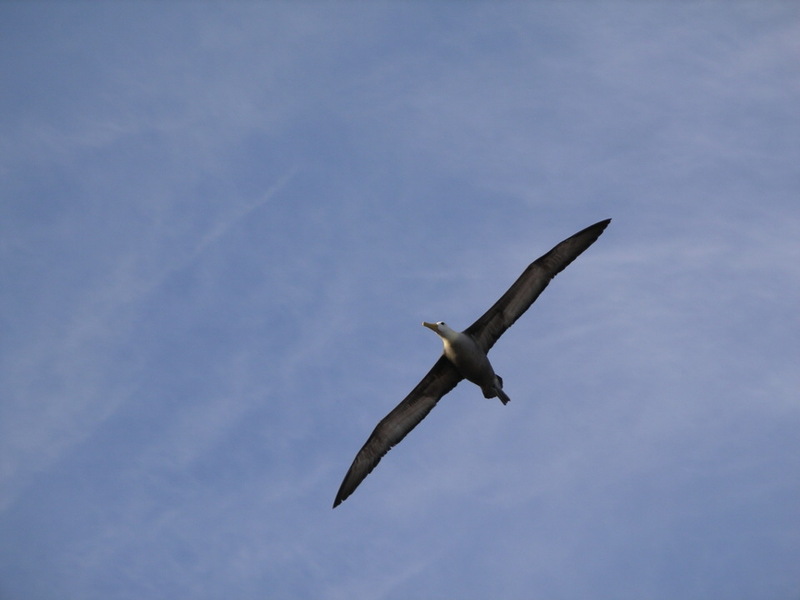 From all perspectives, this is a good sign, especially because the arrival of albatrosses often functions as a “forecast” of the cooler waters that are gradually moving in, with the winds serving as the main drivers of change. The Galapagos albatross is therefore the only real example of a species that truly flies away and actually leaves the Galapagos Islands. In a certain sense, you could see it as a short-lived migration, but it is quite a unique one, as albatrosses will spend their entire time away simply floating over the vastness of the Pacific Ocean. If you belong to your local neighborhood albatross club, or if albatrosses are your personal passion, then you definitely need to explore the Galapagos between April and January. In terms of what itinerary brings you to the haven of Española Island, well then Yacht Isabela II delivers a great selection of islands and visitor sites on its Southern Galapagos Islands itinerary. This specific itinerary runs from Friday to Tuesday and explores other top islands such as Floreana, Santa Cruz, and San Cristobal. And while it may seem like albatrosses are the iconic species for this itinerary, keep in mind that there are other equally iconic species that are quite stunning too, such as: giant tortoises, colorful marine iguanas, flamingos, and all three species of boobies. Some stops will be made at the exact same place that Darwin himself explored back in 1835. Without a doubt, it is a highly rewarding and enlightening voyage. It’s also worth mentioning that the central/southern/eastern regions of the islands hold some of the largest marine biodiversity of the whole archipelago. Landscapes experienced along this itinerary are also perhaps some of the most varied due to the variety of their geological age. From a geo-tourism perspective, this itinerary is certainly one that will keep you busy documenting the stunning visual components of this trip.